It began with a man, a shovel, and a dream: Dr. William M. Kelso set out to defy conventional wisdom and find the original Jamestown Settlement. It all began with a man, a shovel, and a dream. Archaeologist Dr. William M. Kelso was sure that conventional wisdom was wrong—that the old triangular fort still existed beneath the reddish-brown soil of Jamestown Island. The island is owned by the Association for the Preservation of Virginia Antiquities (APVA), which granted Kelso permission to dig. There wasn’t much money in the beginning, so Kelso’s team consisted of one man—himself. One fine April morning in 1994 Kelso walked to the edge of the island and started digging. It seemed quixotic, but soon Kelso was uncovering brass buttons and other classic signs of human habitation. Against the odds, he had found James Fort, the “Holy Grail” of colonial American archaeology. Funding was found, and the Jamestown Rediscovery Project was born, a work-in-progress that continues to this day. One pit alone yielded over 70,000 artifacts, many of them military in nature. These objects round out the writings of Captain John Smith and others, showing a more complete picture of early colonial military history. Armor was entering a long twilight, but still had its uses in America. In the 17th century the European foot soldier came in two basic types: musketeer and pikeman. One of the pikeman’s major missions was to guard against enemy cavalry while a musketeer reloaded. As we have seen, pikes were largely discarded, but a pikeman’s light armor was more than adequate protection against Indian clubs and arrows. The basic pikeman’s suit was a breastplate, a backplate, and two lower steel projections called tassets. Altogether, the whole ensemble weighed about 25 pounds. Tasset strips have been found at the Jamestown settlement, as well as a breastplate. Interestingly, the breastplate seems to have been cut down, perhaps in an effort to make it lighter and its owner more mobile. Europeans had a variety of helmet types to choose from in the late 16th and early 17th centuries. Many Englishmen seemed to favor the cabasset style, a no-nonsense “pot” arrangement with a narrow brim. A complete cabasset was found at the Jamestown colony dig, the first of its kind uncovered on Jamestown Island, and quite a prize. Officers might wear a burgonet, an elaborate steel helmet that featured a visor, a “cockscomb” that ran along the skull, and two cheek-pieces. A burgonet helmet cheek-piece was found at the site, complete with distinctive ventilation holes. 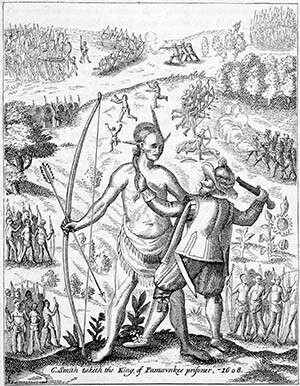 The native Indian tribes seemed to fear firearms, which made such weapons quite important to the colony’s survival. Most basic was the matchlock, with a 48-inch barrel length and an overall dimension of about 62 inches. A lead bullet—or, sometimes, a handful of smaller balls called birdshot—fired when a powder charge was ignited. A lighted matchcord was held in place by a serpentine. When the lever or trigger was pulled, the serpentine went forward and the lighted end of the match touched off powder in the pan. The pan explosion went through the touchhole and in turn ignited the coarser powder in the base of the musket. The bullet was then fired. Parts for at least 12 matchlocks have been dug up. Most are of the lever type, based on the old crossbow. This arrangement was more prone to accidental firing, and later models had the more modern triggers and trigger guards. Some types of matchlock muskets were so heavy a rest was needed to fire the gun. The U-shaped end of just such a rest has been found, though without the long-rotted-away wooden staff it would have been mounted on. Matchlocks were muzzle-loaders, so a musketeer needed a supply of powder on his person. In the 17th century musketeers wore a belt over the shoulder and across the chest known as a bandolier. Twelve metal cylinders dangled from the bandolier (sometimes dubbed the “Twelve Apostles”), each containing a powder charge. Over 30 of these powder cylinders have been recovered from the Jamestown settlement site, mute but eloquent testimony to the importance of firearms. The bandoliers were handy, but accidents could and did occur if a lighted match got too close to an open powder cylinder. The cylinders had little metal caps, but on the march the very movement of a man’s body might cause them to come off and the powder to spill out. The metal cylinders dangled freely from the bandolier, and when they knocked together they made a noise that an enemy could hear from a distance. In February 2003, the possible grave of Captain Bartholomew Gosnold was discovered. Gosnold was a prime mover in the establishment of the Jamestown settlement as well as Vice Admiral of the colony. Positive identification of the skeleton must wait until DNA testing is performed. A staff and the decorative head of a half-pike or walking stick were found with the skeleton, attesting to the man’s importance. Tags Crossbow, Europe, Jamestown Colony, John Smith, military, military history, weapons, William Kelso.